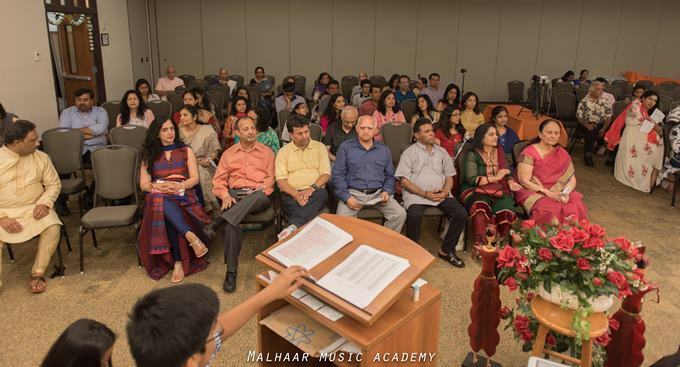 May 12, 2018 was a big day at Mansour Conference Center in Marietta as Malhaar Music Academy (MMA) held its second annual recital. 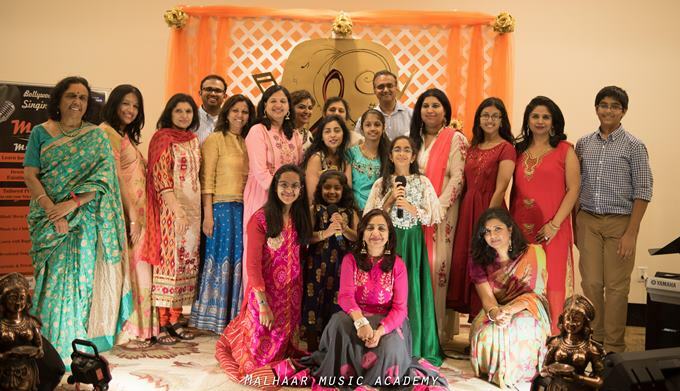 Progress is moving towards a goal, and at the inaugural recital, Purnima Rai Mathur, the owner and director of MMA, indicated that spreading happiness through music was what prompted her to take up teaching music. Gauging by the “Smile-o-meter” at the hall this year, it was not hard to conclude that progress is being made in giant strides. This occasion was graced by Consul D. V. Singh, event organizer/promoter Mustafa Ajmeri, music lovers Navin Tyagi and Prabha Tyagi, and family, friends and well-wishers of the students and MMA. The stage backdrop, designed with a centrally located artistic treble clef with various musical notes and symbols, created a magical setting for the music that echoed around the venue hall for the duration of the recital. Along with several returning students, many new ones showcased their hard work and talent while an attentive audience soaked up the performances. Many of those who attended the inaugural a year ago were amazed by the degree of development shown by the returning students. Leading the show was Diya, all of 5 years old, who sang her selections by memory in near-perfect tune/pitch and with some fast-paced, tough lyrics. Music is a feeling expressed with rhythm, and student after student conveyed this with heart-felt performances. The passion and energy was so evident that Mr. Ajmeri declared on stage that, for future events, he may not need to bring artists all the way from India. Local talent was in full bloom. A special new feature in this year’s recital included a dance performance to a medley of songs sung by none other than Purnima Mathur, a visual treat in the midst of an auditory feast all evening long. A write-up of this event cannot be complete without mentioning the amazing emceeing by young Hersh Mathur whose lighthearted banter with the performers and audience endeared him to all. Hersh showcased more talent when, for one of the items, he delightfully played the piano, enhancing his mother’s melodious vocals. The event was conceived and conducted by Vikram Mathur. The affection between students and teacher was unmistakable in the words of mutual praise and gratitude genuinely expressed by students as they took the stage. Good music is not just for our ears; its health benefits are evidenced in the use of music therapy in medicine. MMA appears to be delivering an added dimension through laughter during classes, and they are receptive to students who discuss their problems. MMA cries with them with pride and joy as they surpass musical challenges they thought were insurmountable. Indeed, one student remarked that her BP shot up during the weeks that she missed classes. Learning is not always about attaining perfection; it is about enhancing one’s understanding and reveling in the process of attaining the next level. With this motto, all the student performers said their goodbyes with a promise to get better with time. And getting better is what MMA is all about. Glimpse of 2nd annual recital on tv Asia !!! Enjoy this beautiful cover of the song Benaam Khwaayishein sung by Purnima Mathur....a small musical gift for all from Malhaar Music Academy ....Happy New Year to all. 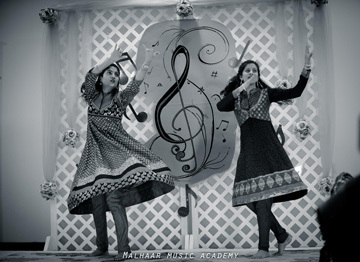 Come and enjoy the music with Malhaar Music Academy. Indulge yourself in the most relaxing and creative art and you will feel the happiness within.